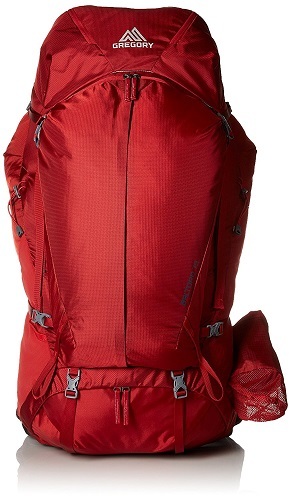 This is the Gregory Baltoro 75 liter hiking backpack. Gregory Mountain Products was founded 1977 in San Diego, California and today is one of the top leading hiking backpack creators. The passion for creating backpacks started at the early age of 14 for Wayne Gregory and thankfully we get to see that inspiration in these backpacks today. The Baltoro is just one of a number of designs that Gregory has available but the Baltoro is probably one of the best internal frame hiking backpacks you could consider for your next trip. It’s not the most stylish piece of gear but it certainly isn’t bad either, it’s also durable, has great features and probably the most comfortable backpack you will ever use. Below we’ll go into a little more detail into each of these areas to show you what exactly the Baltoro 75 has to offer but if you are pressed for time and need the short version you can check out what’s good and what’s bad, down below. So read on and get ready to pull your wallet out to make a purchase as this is definitely a tough pack to turn down. The Gregory Baltoro 75 liter hiking backpack has about as much style as you would expect for a hiking backpack. It’s not the most stylish looking thing you could strap to your body but it’s not supposed to be; although it is considerably better than other packs we have looked at. 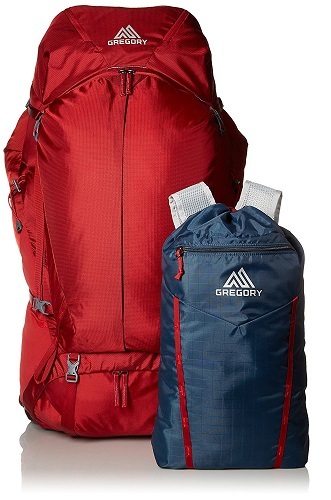 The Baltoro 75 is offered in three different colors to choose from which is more than most other packs that are offered by Gregory. While most only come in black, the Baltoro 75 is offered in Shadow Black, Navy Blue and Spark Red. Most hiking backpacks tend to be constructed with a sturdy and resistant nylon, just like the Baltoro 75 has. They also are usually big, bulky and ugly to look at. I can with confidence say at least the Gregory backpacks have nice lines to them; it also doesn’t hurt that they are internal frame hiking backpacks. With these types of bags, a common question or concern always comes up and that is how big are the backpacks and what size should you get. Let’s look at the dimensions of the different sized packs and we’ll explain in the next section how to choose the right one for you. The Gregory Baltoro hiking backpack is a sleek looking backpack with just a few colors to choose from but the few colors it has look fine. The lines on this backpack are slim and flow very well. Although the outside of the bag is pretty bland and boring it’s a moot point really as trying to look good while hiking is the last thing on anyone’s mind. The bag has a lot going for it and overall it’s a decent bag in terms of style. With what is currently available on the market, this is one of the better bags that you can choose from. Looking at this bag compared to what else there is to choose from this Baltoro backpack gets 5 out of 5 stars for style. Comfort is Gregory’s middle name and if it isn’t it should be. He created this hiking backpack brand initially with one thing in mind; making this the most accurate fitting hiking backpack you could get on the market. And sure enough the response has been incredible and the product equally amazing. The Baltoro features a proprietary system that is designed to keep you comfortable for your entire hike, mile after mile. The groundbreaking and award winning proprietary system that Gregory has implemented with their Baltoro backpacks is known as Response A3 suspension or Automatic Angle Adjust and is the sole reason why you stay comfortable and balanced your entire trip through the outdoors. The A3 technology allows both crucial points in the packs structure, the shoulder harness and hip belt panels, to pivot independently of each other allowing it to conform instantly to the angles of your body while moving. First locate your Iliac Crest, it’s the top of your hipbone directly on your sides, usually in-line with your belly button. Second, locate your C7 vertebra, this is the largest bump on the back of your neck when you touch your chin to your chest. Third, measure the vertical distance down your spine between these two points and that will give you an indication of what size to go with. 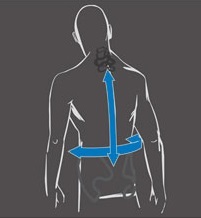 A wishbone frame makes up the majority of the back panel and allows it to send most of the load to the center of the hip and lumbar region which allows for excellent support while hiking. One of the most crucial aspects to hiking is to get the weight onto your hips to take the stress off your shoulders and back and that’s exactly what the wishbone frame does. Another important aspect to any hike or just traveling in general is that you always want to stay comfortable and staying dry is comfortable. The Baltoro 75 has a ventilated center that is not only great for keeping your back dry but also feels amazing as it has a multi-layer of EVA foam and silicone grip overlay in the back area which provides great stability and excellent comfort. 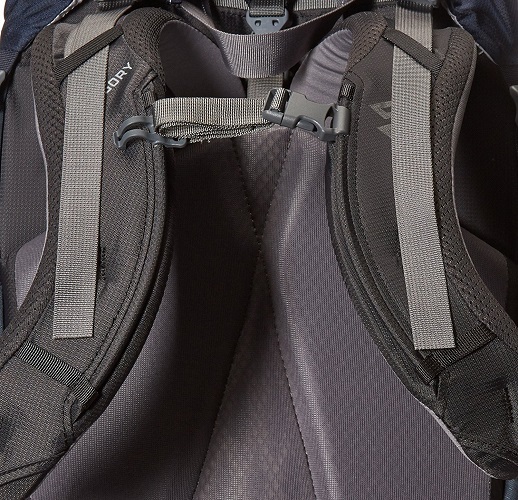 While on the subject of lumbar support, Gregory added a lumbar tune to the Baltoro which allows for a removable EVA foam shim which allows the backpack to customize the contouring to achieve the perfect comfort position of the pack. What’s also great is that the hip belt also comes with EVA foam padding which will help relieve pressure on your hips seeing as that’s where most of the weight of the pack will be. Finally the Baltoro hiking backpack comes with the ability to swap out pre-curved shoulder harness straps and hip belts to achieve the perfect custom fit for whoever may be using the backpack. This allows you to adjust on the fly to make sure this backpack is nothing but comfortable. Gregory has done a damn fine job with their Baltoro 75 liter hiking backpack and I can say that it is perhaps one of, if not the best hiking backpack in regards to comfortability. They went well above and beyond what they needed to and it’s all in the name of hiking comfortably. 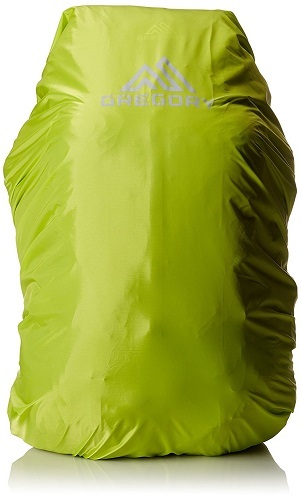 The Gregory Baltoro 75 easily gets 5 out of 5 stars for comfort. When it comes to durability it seems that most packs these days are all very similar in their approach on how to keep the packs like new as long as possible and most are even adapting similar warranties to provide to their customers. Gregory has fallen in suit with this and that’s not a bad thing but let’s see exactly what they do to make sure you pack will last you for many miles and trips to come. First let’s talk about perhaps the most important aspect of keeping a hiking backpack and its contents safe and that’s keeping it dry and safe from the elements. The Baltoro has an integrated rain cover that easily fits right over your pack in no time to keep your bag dry and the contents in it as well, plus it is color-matched to your backpack to keep you stylish, because that’s a top priority and all. 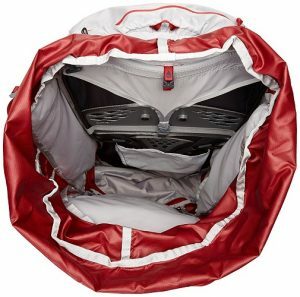 To locate the rain cover it is inside the main front pocket, inside you’ll find a horizontal zipper with the rain cover in there. Another neat feature that certainly comes in handy has to actually do with the hip belt pockets. The hip belt pockets have a WeatherShield design which is meant to protect your valuable and electronics. This is great as most people will keep more of the important stuff in easy to reach, easily accessible areas and the hip pocket is one of them. Unfortunately it doesn’t hold much more than a smartphone. Lastly and perhaps most importantly is the warranty that Gregory offers. How you know that a product is solid and worth investing in is when the company stands by what they make with a lifetime warranty and that’s exactly what we get when we purchase this hiking backpack; a limited lifetime warranty against defects and craftsmanship. It’s always great to see a company take so much pride in their products. The Baltoro 75 so far has done an impressive job and I don’t see that slowing down anytime soon. The hip belt WeatherShield, the integrated rain cover and the lifetime warranty all speak to a product that is built to last, which only makes it even more convincing to pull the trigger on this backpack. 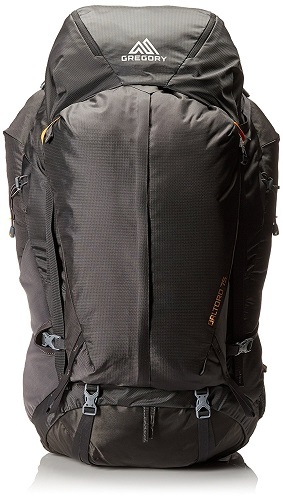 Taking this all into consideration the Gregory Baltoro 75 gets 5 out of 5 stars for durability. The best part about buying or reviewing a product is getting to see all of the neat features that it brings to the table. 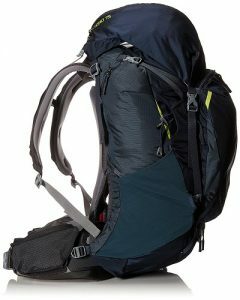 I can easily say that the Gregory Baltoro 75 has quite a few features and most of them make backpacking so much easier. Any good hiking adventure will have you need to stay hydrated and pretty much constantly. One of the great things about this backpack is that it gives you two options for staying hydrated built right into the pack. Not even taking into account any other items you stick in the bag. Each Baltoro backpack is made with the Sidewinder bottle holster on the right side of the pack. This allows you to hold your water in an easy to reach place for quick thirst quenching H2O. If one bottle holster isn’t enough then you’ll be glad to know that the Baltoro comes with a separate and attachable daypack/hydration sleeve. Just as I mentioned the separate pack, known as the SideKick can be used for a number of reasons but to touch on our previous point, you can use it as a hydration sleeve. This will basically allow you to pack a CamelBak or Platypus hydration pack, which does not come with by the way, into your hiking gear which allows you to have plenty of water the whole time. On the flip side if you don’t need the extra water the SideKick can be used separately as a daypack if you don’t need to carry around the main pack. 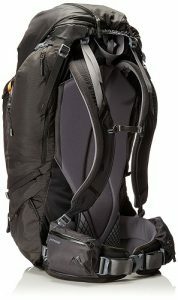 Perhaps one of the best adjustments that I see travel gear producers making and I first saw it with Osprey, is the implementation of panel loading or front U-zip access which allows you to open up the backpack to the main body compartment like a suitcase to access anything you need without having to pull everything out like a top loading backpack. Thankfully Gregory has followed suit. The Baltoro 75 comes with 5 exterior pockets although two of these are in the hip belt so that leaves us with 3 others. There are two side mounted zippered pockets, one on each side that allows you to store some essential gear or any items you need to get to quickly. The last pocket is on the bottom of the back and is typically used as a sleeping bag compartment. It’s not huge and best used for smaller newer sleeping bags. Finally to round it all up this backpack does a fantastic job of hauling semi heavy loads. It is easily capable of carrying up to 45 pounds and I can see this easily carrying more. One down side is that it does not have many areas for you to attach additional equipment on the outside; the downside of having an internal frame. To make up for this I would like to have seen some additional functional pockets, not small pockets like the ones on the hip belts. The Gregory Baltoro 75 pack does a great job of providing us with essential features that we would look for in any hiking backpack and also adds a little convenience with things like the U-zip access. It’s more of a nice to have than a necessity but all the same a great feature. For having only a small downside to its functionality, I have to say the Baltoro gets 5 out of 5 stars for functionality. Backpacker Magazine’s 2015 Editor’s Choice Gold Award. Outside Magazine’s Gear of the Year Award. With this type of reputation one can only hope that the actual product lives up to its billing and the Baltoro product line does. Between excellent and innovative comfortability and interesting feature designs, the Baltoro is a highly sought after backpack. Let’s recap what we found to be good and bad with this hiking backpack. 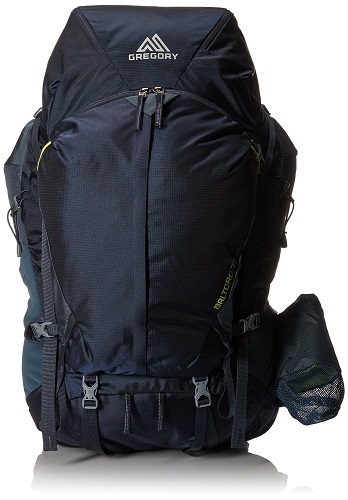 The Baltoro 75 has slim lines which give it a very sleek profile and for a hiking backpack that’s saying a lot. It is currently offered in three different sizes, small, medium and large depending on your torso measurements. Gregory has designed a proprietary Response A3 suspension system for the Baltoro line of backpacks that is incredible. The backpack harness pivots to adapt to your body as you’re moving through the wilderness. A wishbone frame sends most of the weight to your lumbar region to put most of it on your hips and not your shoulders or back. To provide further comfort Gregory has made the back ventilated to keep you dry and also meshed it with EVA foam padding and silicone overlay to provide support and stability. Removable foam shims, exchangeable pre-curved shoulder harness straps and hip belts are additional features that make sure you get the most comfortable fitting backpack in the industry. Features an integrated rain cover that easily slips over entire backpack for those times when you’re battling the elements. The hip belts have a WeatherShield design that is perfect for protecting your valuables, including smartphones. Each pack comes with an attached SideWinder bottle holster to keep you hydrated. If you need additional hydration the included and integrated daypack can be used to hold a CamelBak or Platypus hydration pack. Front U-zip access, also known as panel loading, allows you to access the main compartment contents without having to go through the top of the bag and pull everything out first. Baltoro 75 has 5 exterior pockets; 2 hip belt pockets, 2 side mounted pockets and one sleeping bag compartment on the bottom. This backpack can easily haul loads of 45 pounds plus, without any discomfort or compromise to the integrity of the bag. 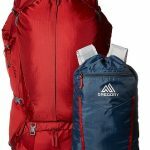 The Gregory Baltoro 75 has won a couple of awards for being one of the better hiking backpacks available on the market. Gregory stands behind their products and has a limited lifetime warranty. This hiking backpack although not supposed to be known for its stylish design is only offered in 3 colors to choose from; Shadow Black, Navy Blue and Spark Red. Not being an external frame backpack, the Baltoro 75 lacks many external attachment points therefor limiting how much you can actually carry with this backpack. The bag is a bit pricey but if you are looking for a backpack that feels amazing to carry and will last you a lifetime then I’m sure you can justify the expense. The Gregory Baltoro 75 liter hiking backpack has impressed us thoroughly, especially with its incredible and innovative designs towards making this one of the best fitting hiking backpacks or simply any backpack, period. It’s extremely comfortable and that makes hiking all that much better because nothing’s worse than hiking with a heavy pack that hurts. The overall value of this backpack easily demands the price that it asks. Although it seems to be a bit pricey, it actually is in line with the average price for a 75 liter hiking backpack and for what you get in the world of hiking the costs is well worth the enjoyment you’ll receive from the backpack. Nonetheless a little cheaper would be nice. After looking over all of the positives and the few minor improvements that could be made we’ll give this Baltoro hiking backpack 4.5 out of 5 stars.